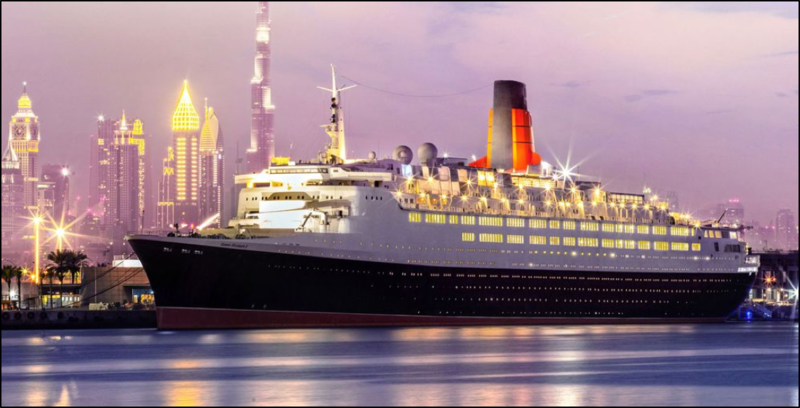 Ten years after her arrival in Dubai to great fanfare, the former Cunard liner Queen Elizabeth 2 underwent a “soft opening” last week (April 18) as a luxury floating hotel and museum following a stem to stern refurbishment. 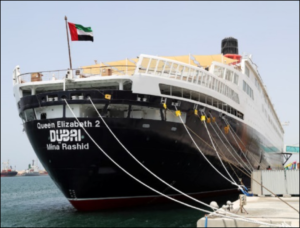 The vessel was purchased in 2008 for $100 million with the objective of adding her to an already long list of tourist attractions in Dubai but the financial crisis of 2008/09 which hit Dubai particularly hard left the vessel’s fate in limbo. 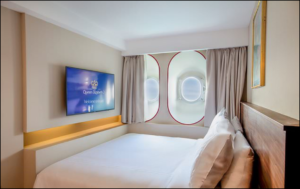 However, with all now back on track and a grand formal opening scheduled for October this year, she is following in the footsteps of family member Queen Mary in Long Beach which, despite all manner of financial ups and downs, continues to survive as a hotel and conference centre. Built by John Brown & Co, Upper Clyde Shipbuilders, Clydebank, Scotland. 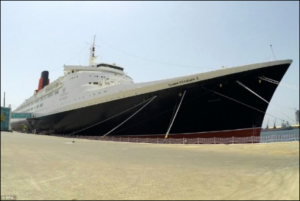 QE2 was originally fitted out with a steam turbine propulsion system rated at a maximum power output of 110,000 shaft horsepower and coupled via double-reduction gearing to two six-bladed fixed-pitch propellers. However, these proved unreliable from the outset and with a fuel consumption of 600 tons/day, the writing was soon on the wall. During her 1986 to 1987 refit, the steam turbines were removed and replaced with nine German MAN L58/64 nine-cylinder, medium-speed diesel engines. 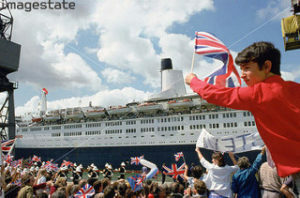 During her years of service, QE2 sailed around the world 25 times, carrying more than 2.5 million passengers. 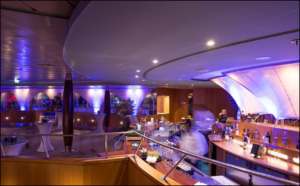 Now permanently moored at Mina Rashid port in Dubai, she has been refurbished based on her original design, from carpets to the theater and even restaurant menus featuring dishes served in the liner’s heyday. Large portraits of United Arab Emirates rulers hang opposite portraits of a young Queen Elizabeth II and Samuel Cunard, founder of the company. 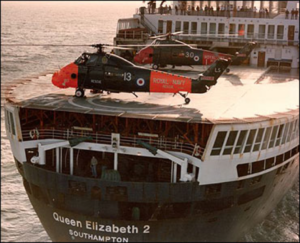 In May 1982 at the outbreak of the Falklands War with Argentina and the decision of the UK Government to send a naval task-force to the South Atlantic, QE2 was requisitioned as a troop carrier. Helicopter pads were installed on the poop deck, public lounges were converted to dormitories and she was modified to allow for refuelling at sea. Around 650 Cunard crew members volunteered for the voyage under black-out conditions which took 3,000 members of the Fifth Infantry Brigade to the Falklands. She returned to passenger service in August 1982.